Expanding its team of veteran trial attorneys, Phillips Nizer LLP has added Richard Kaye, a prominent business and real estate litigator, as a partner in the firm’s New York office. We are excited to offer Richard’s experience and long-standing success in the courtroom to our clients. From contracts to employment to property disputes, Richard is a winner when it comes to business litigation. 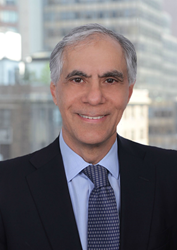 Mr. Kaye joins Phillips Nizer from Ellenoff Grossman & Schole LLP, where he was chair of the Litigation Department and served as one of that firm’s managing partners. Mr. Kaye began his career as an Assistant District Attorney in Manhattan. Representing clients in a wide range of industry sectors including technology, real estate, financial services, retail, professional services and not-for-profits, Mr. Kaye has handled all aspects of civil litigation in state and federal courts from pre-trial proceedings through trial and appeals and in many arbitration and mediation proceedings. In addition to his litigation work for businesses, which includes resolving claims brought under the Americans With Disabilities Act (ADA), Mr. Kaye serves as outside general counsel for companies and represents individuals in business and real estate transactions. “We are excited to offer Richard’s experience and long-standing success in the courtroom to our clients. From contracts to employment to property disputes, Richard is a winner when it comes to business litigation,” commented Phillips Nizer Managing Partner Marc Landis. “I am very pleased to welcome my friend Richard Kaye to our Litigation Department. As a long-time leader of a top flight litigation practice, Richard brings a wealth of experience and leadership to our growing department,” said Mark Elliott, the co-chair of Phillips Nizer’s Litigation Practice Group. “I’ve known the attorneys at Philips Nizer for years and have always been impressed with their talent in the courtroom and their reputation throughout the City as a leader in the legal world. My clients will greatly benefit by my joining Phillips Nizer’s with its broad business, real estate and employment practice and impressive litigation capabilities,” said Mr. Kaye. Mr. Kaye received his J.D. from the George Washington University Law School and his B.A. from Clark University. Phillips Nizer, founded in 1926, represents domestic and international clients in business, finance and real estate transactions, intellectual property matters, commercial litigation and tax and estate planning, with a particular focus on the entertainment, fashion, real estate, sports and technology industries. Established by world-renowned trial attorney Louis Nizer, Phillips Nizer’s principal office is in Manhattan, with additional offices in Long Island and New Jersey. The firm is a member of Ally Law, an association of independent, midsized law firms worldwide. To learn more about Phillips Nizer LLP, visit:http://www.phillipsnizer.com.